Remember when you were a kid, the joy you'd get playing outside after school. You'd come home and immediately, after doing your homework, of course, head over to your friend's house to play ball out of doors, or just explore. Today, thanks to being surrounded be screens since birth, kids are putting in time watching TV, chatting on Snapchat instead of in person, rarely looking up from their smartphone screens. Whether you've heard of nature deficit disorder, or just want to share your love of nature and the outdoors with kids, we've compiled five tips to help you get started. Early fall can be a great time in the garden. The weather begins to cool, and children can get into the spirit of learning while harvesting, discovering the bounty of nuts and berries, or exploring winter garden preparation. But first, let's take a look at why getting kids reconnected to nature is essential for building a lifelong love of the outdoors. Then I'll share five tips to help you get started introducing kids to the joys of life and your landscape! A recent survey of 12,000 adults and children across the United States found that many people feel they have lost a close connection with nature, although many of the respondents expressed a desire to close that gap. The study, The Nature of Americans National Report, found that most adults reported spending five hours or less in nature each week. However, nature deficit disorder was most pronounced in children 8 to 12 years old. Parents said that their children spend three times as many hours with computers and televisions each week as they spend outdoors. At any age, time spent outdoors is beneficial to your physical and mental health. 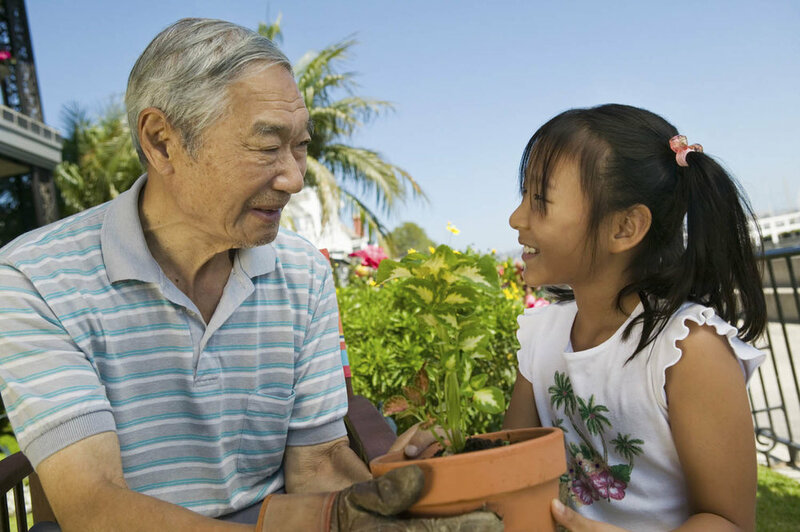 As an older person, you understand the many benefits of working in your Elderyard® provides, from enjoying fresh air and sunshine, benefits like lower blood pressure, increased Vitamin-D, maintaining flexibility and muscle mass. You can also help a child to learn to appreciate nature, which can become a lifelong pursuit that will improve the quality of their lives. Here are five tips for sharing your love of the outdoors with children. 1. Find activities to do together. Think about what's age-appropriate. Very young children may be attracted to bright flowers or interestingly shaped leaves in the garden. Teaching the flower and color names can distract them from picking every bloom on the plant! Encourage them to smell the flowers and gently rub leaves to enjoy the fragrance of herbs. Consider containers on the porch that you and the child can fill with easy-growing plants, then water, fertilize and watch as they change and grow. In many parts of the country, nurseries put out their seasonal fall plants like chrysanthemums. Look for plants barely in the bud so you'll have plenty to watch together. Older children can help dig potatoes, collect fallen pecans, or spread mulch. Have a set of smaller sized tools and small, light containers for hauling. If you show the child what a weed looks like and how to pull them, you might just find your garden beds stripped of weeds in no time. Just remember to watch them and make sure it's not your plants that are being pulled! Sure, you may end up with potatoes chopped by a spade as the child learns to expose the spud before digging underneath delicately. Or, they'll drop and break a small planter or spill soil or water everywhere. That's all part of how we learn, and it can be fun! Not only is the child learning but you are too – learning how to give gentle directions to suit your eager worker's personality – from cautious and careful to rambunctious and able to hold no more than one idea at a time. Plan tasks where making a mistake will do little harm to your landscape. And remember, contractors can tromp on flowerbeds, and frost or drought can kill a favorite plant. Gardens are resilient and will quickly recover from a child's mistakes. If an accident happens, laugh and clean it up together, demonstrating your resilience. 3. Pass on your knowledge. Think about what you know best. Do you have a talent for raising award-winning roses? Do you have a fruit garden bursting with late-season raspberries or blackberries? Maybe you're a late-blooming gardener, and you're just learning yourself. If your pleasure in nature comes from garden experience, that's wonderful! But if you're a garden-watcher, following the birds, bugs, and butterflies that visit, focus on your passion with children in your yard. They will get excited about what you get excited about. 4. See your garden through their eyes. Functioning at a child's eye level is a great way to gain a new perspective of your garden. Find low benches, kneelers or even a rolling seat so you can see you garden as a child sees it. Sit on the ground, perch on a rock or seating wall. Notice the garden’s smells, sights, touch and sound from this perspective. Then ask what they are observing so you can explore what they noticed together – or what either of you missed. Maybe there's an old bird's nest low in a shrub that is visible because the shrub's leaves are falling and it's located right in front of your eyes. Or maybe there's a toad in that broken pot-turned toad house that's not visible when you're standing. Or being on kneelers is the perfect angle to notice butterflies puddling in a muddy spot. 5. Play, be silly and enjoy your time outdoors. For an adult in the garden, sharing your love of gardening with a child means you can dig in the dirt, splash in puddles, build a temporary sculpture from rocks that you balance on each other, or have a tea party with nuts and berries on plates of petals. Play is good for you at any age. Allow yourself to be in the moment and immerse yourself in imagination. Laugh, giggle and do the silly things that make children laugh. You are the best hope when it comes to introducing children to the natural world. It's important to stimulate their minds, share your knowledge, and your joy of nature with a child. A child's brain is open, receptive, and willing to engage in new tasks. Today, with the growing interest in environmentalism, it's more important than ever to introduce children to the beauty and wonder that is nature.